INDIANAPOLIS — In accordance with a presidential proclamation issued this morning, March 7, Gov. Mike Pence has directed flags at state facilities statewide be flown at half-staff to honor the memory and service of former First Lady Nancy Reagan. 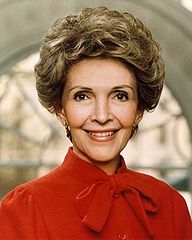 First Lady Reagan passed away yesterday, March 6. Flags should be flown at half-staff beginning immediately until sunset on the day of interment. Pence also asks businesses to lower their flags to half-staff to honor former First Lady Nancy Reagan for her service to the United States.